August | 2011 | E-verything! This Fine Focus session was a little different from usual! I am always trying to think of new topics and different ways we can approach these in our virtual room. As most of you know I have a permanent “bee in my bonnet” about the webinars being participative and interactive and I try very hard to avoid sessions where I talk too much! This session was (I think) very interactive as well as exciting – checkout the recording and see what you think. The idea behind this session comes out of my desire to always have some – easy to learn, quick to use and no need to register – online tools at my fingertips. Many of my students (previously face-to-face and now online) lack motivation and engagement – they are often unwillingly in education/training – so being able to give them a task that involves using a quick to learn tool to create a visual outcome can be an effective engagement strategy. 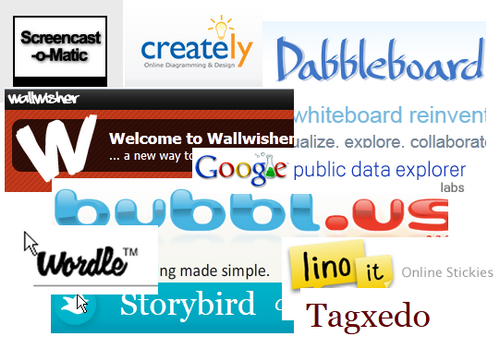 For the session I collected together ten links to what I hoped would be small easy to learn and use online tools. Some of these I was already familiar with, some I had heard of but not used and some were completely unknown to me and found through a search for a type/function of tool. We started with a series of quick polls to gauge familiarity with each of the ten tools. The degree of familarity ranged from some people using a particular tool quite regularly to at least one tool with no-one having any experience of its use. The main part of the session was based on a quick exploration of a chosen tool by each participant. For this we had a table of the tools and everyone put their name beside the tool they were going to explore. We then allowed a timed ten minutes to “play” with the tool – the rationale being that if it took much more than ten minutes to use at the most basic level then it would not be very useful with students as a quick re-engager. The “playtime” was followed by quick evaluations from individuals of their chosen tool against the following criteria: ease of use; how quick to learn; potential usefulness with students. This different way of running the session was exciting for me and seemed to be very much enjoyed by everyone. I really loved the evaluations and comments from everyone on the tools they had explored. It felt like a very valid way to investigate tools that we might ask students to learn and use very quickly. I am well aware that if I can’t use the basics of a tool in 5-10 minutes then it is unreasonable of me to expect my students to do so. I think if we have a favourite tool that we use often we sometimes forget how long it took us to get started with that tool when we ask our students to come to grips with it in minutes! Feedback on the session was very positive with suggestions that we do something similar again and also some terrific ideas for variations such as small groups evaluating a tool and feeding back or taking a tool away and then coming back to a later session with a more detailed evaluation. The chosen topic for this session was a bit of a blend because we had a larger than usual selection of topics we combined two similar ones “Class based projects” and “Sharing projects with other classes around the world”. This was a terrific session recorded as usual, and with many ideas shared on the whiteboard, in text and through audio. We did a double poll as we had more than five possible topics and then were able to combine the most popular as they were about projects. This was a very lively session with lots of discussion through the whiteboard, in the text and via audio. There were also a number of references to and links for projects just starting or already in progress and also for some former ones. Some (hopefully most) of those mentioned in the session are given here! This session has made me think again about some of the activities I have done with my regional students in the past (for example a publicity or tourist leaflet for their own community) and how we might take this global. I was also interested in how many of the ideas were based around non-tech ways of sharing but further enhanced by the inclusion of an “e”-facet. For this session we were joined by Jane Curry, who is @parrpakala on Twitter, and a group of her students. Jane and her students talked with us about some of the “e-stuff” they use in their English language learning. The students also told us a little about their backgrounds and former school experiences. Checkout the recording to hear and see this exciting session. The session was informal and was very much a conversation with Jane telling us about some of the e-activities her students undertake and then the students joining the conversation and answering some of our questions about their learning. Jane uses her “Youth Class Blog” as a thread for the activities and Web2.0 tools she uses with her students. 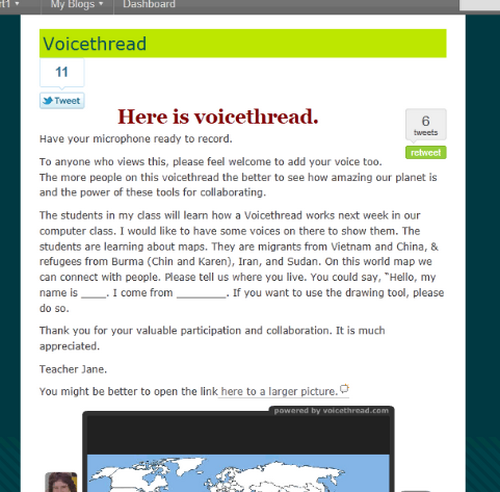 Recent activities include a VoiceThread. Jane also records her students and uploads the videos – fantastic for language learners to see and hear themselves speaking the language. We watched one of these videos where Lan talks about the school she went to as a child. This session was itself another Web2.0 experience for Jane’s students who overcame their shyness to join in, answer questions and tell us a little about their own thoughts and experiences. For me this was a really exciting session! I love it when we have students involved in webinars in some way and would be delighted for it to happen more often. The chosen topic for this session was “Essential questions”. The term was new to me although the concept was not As always the session was recorded and with a good blend of audio, text and whiteboard is well worth catching. We had several topics to choose from this week and the choice of “Essential Questions” was intriguing for me as I was unfamilar with the term – however the early discussion revealed that these were the driving questions of inquiry based learning. An intial one with some ideas about the need for essential questions and how to provide professional development for others in developing those questions. Because we were using audio and textchat to a large extent the whiteboards have perhaps less than usual of the session content. This session certainly gave me and I think other participants food for thought. Mulling over the session afterwards I was thinking about the many skills that students need for this kind of learning and in retrospect I don’t find it suprising that the majority of resources that I use myself are what I would term “guided discovery” in that I provide a framework and scaffolding using a “research” model to support students in developing the skills. 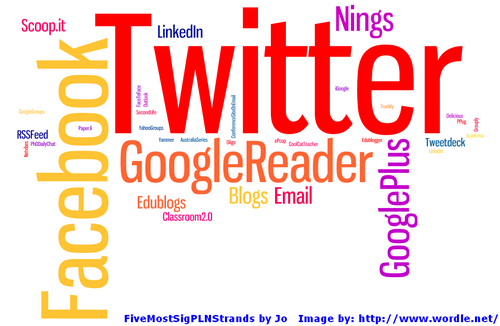 #RSCON3 – A finger on the pulse of my PLN! 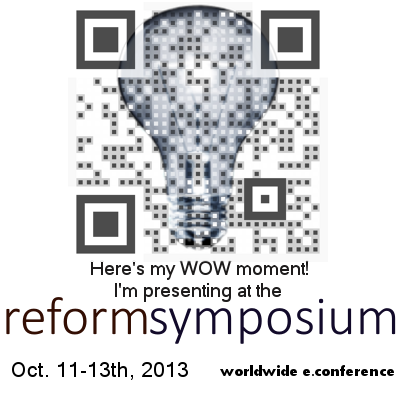 Now that my mental dust has settled it’s time to write about the Reform Symposium. 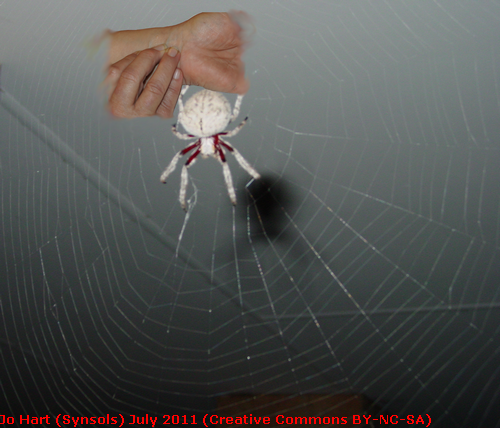 This is the first of what I hope will be three posts and is an overview of the session I presented on iGoogle – “Keep a finger on the pulse of your PLN” – with some reflection included. The session was recorded as were all of them here is the link to “Keep a finger on the pulse of your PLN” other sessions can be accessed via the Reform Symposium Conference Spreadsheet. I seem to have been talking about iGoogle a lot over the last year and will be continuing to do so as I am delivering a Professional Development session on it for colleagues in a few weeks. The ever increasing flow of information across our desktops generates a need for some way of handling and drawing together the threads. This was a great session for me and hopefully also for those participating. After a bit of scene setting we started with a poll on how familiar participants were with iGoogle and then a whiteboard for sharing ideas about what exactly it is! I also asked for people to share on a whiteboard the five main strands of their PLN so that I could get a feel for the gadgets needed by the majority – these were fior Twitter, Facebook and Google Reader all of which I already had on my iGoogle page. I found this really exciting because as I was sharing people were opening and exploring – sometimes “dusting off” their own iGoogle (or in some cases starting their own iGoogle ac). This made the session very participative as there were practical questions coming through text chat – including as always at least one I couldn’t answer about making tabs public. We finished with “take-aways” these are always fascinating for me because they are so varied and illustrate so well how different we all are in our perceptions and understandings. 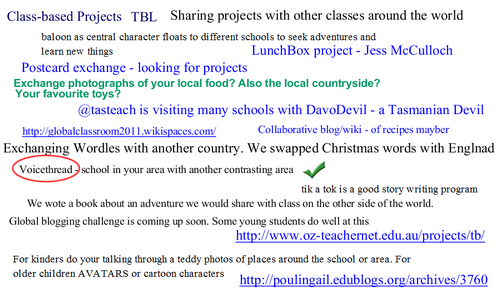 This time (very pleasing for me) there were many intending to experiment with iGoogle as a possible hub for their own PLN. I really enjoyed doing this session for several reasons. The Reform Symposium (#RSCON) events always have such a buzz about them so just being part of it is exciting. I love it when I go away with homework from my “class”. It just confirms to me again that one of the best ways of learning and embedding understanding of something is to “teach” others about it! It is another fantastic way of connecting with my PLN around the globe – these events always feel to me as though I already know most of my audience. Having a global audience has an incredible feel all of its own and I find it quite awe inspiring that people from so many different places have chosen to come and listen to me. I’m already looking forward to the next event and would like to finish this post with some thanks! Firstly many thanks to Denise (@mrsdkrebbs) for being a fantastic Moderator for my session. Secondly a huge THANK YOU to ALL the organisers for their tremendous contributions to the smooth running of the event – in many cases behind the scenes. Thirdly very special thanks to Shelly Terrell (@ShellTerrell) (she who needs no sleep) and Clive Elsmore (@CliveSir) (master of timezones) for their stamina and overwhelming committment to making #RSCON3 such a success. Apologies all for the delay in publishing this overview – a combination of #RSCON3 at the weekend and preparing professional development sessions for colleagues has kept me from finishing this post. This was an incredibly useful session at least for me! I am frequently irritated by videos that take forever to load when I click on them and as a consequence I rarely view embedded videos. Although the purpose of this session was to explain how to re-size videos appropriately so that they could be used practically in a virtual classroom eg Elluminate context I think that there are much wider applications for anyone uploading video for others to view. Phil did a brilliant job particularly as he was also coping with the idiosyncracies of the Elluminate replacement – Blackboard collaborate. Checkout the recording for the full session. Throughout the session Phil showed us, and discussed, a number of examples of different sized files and talked about the impact on resolution. One of the issues we face with video is the need for trade-offs between size on the screen and file size which affects download time. Next there was quick look at some of the file formats in use with reference to the need to choose one of the very common ones to ensure that the majority of viewers will have an appropriate player. 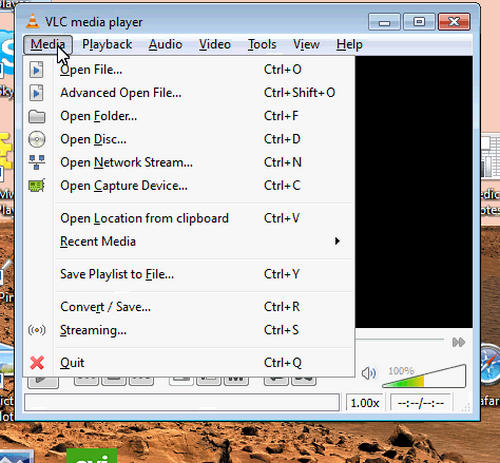 We were introduced to Phil’s favourite video player/converter – the VLC Media Player – a free download. The formal part of session ended with a demonstration of the conversion process and a look at the need to experiement a little to find out what works best. However there was some continuing discussion and experimentation with the new Blackboard Collaborate interface – including a collection of images posted on the whiteboard. I know I will refer back to the content of this session because one of my objectives for the near future is to explore and use video more often. Because of issues with bandwidth and download costs for my students it has always been something I have tended to avoid apart from occasional links to pre-existing videos. However if I can produce videos that are not too demanding on infrastructure I will use them more because they can add an extra dimension for my students.